Now that we have had a couple of “warm” days (above 40 degrees), I have been out in the garden taking inventory of what spring bulbs might be peaking out of the soil. So far, some of my Iris bulbs are coming up and I can’t wait to see if they bloom this year. We have a lot of great garden centers here in the Twin Cities – Bachmans, Linders, etc, and it is hard to drive by them because I have that garden itch. Of course, they don’t have anything right now except seeds. Speaking of which, my current indoor garden project is growing tomato plants from seeds. 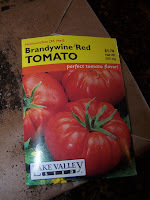 The first post for this year on my garden blog is my tomato experiment. If you have that spring garden itch too and want to get some ideas of great garden centers around Minneapolis and Saint Paul, check out this forum, which has some locals give their opinions.